– This women’s racerback tank is soft, lightweight, and form-fitting. The triblend fabric gives the printed designs a cool, faded look while the raw edge seams add an edgy touch. 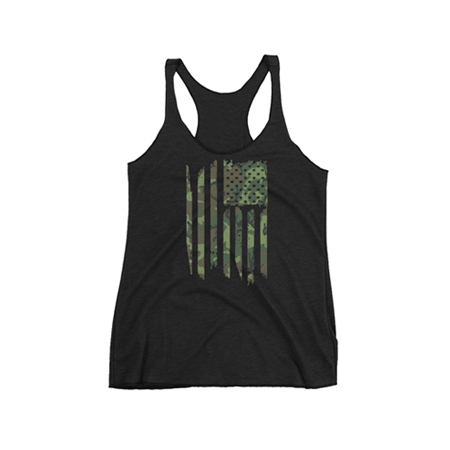 – The Camo Flag Tank from our Hero Collection is devoted to the men and women serving our country. We are dedicated to honoring their service and remembering their sacrifice. A portion of sales from each purchase from our Hero Collection will be donated to a foundation that supports our Heroes each month. For more information on the organization of the month please click here.